So a few years ago, despite having been warned off it, I finally watched The Web Planet for the first time. And you know what? I really, really liked it. And now I finally get to talk about it! First off, it looks fantastic. I love the sets in this story. I think that Vortis is one of the best alien landscapes of early Doctor Who, which is incredible when you remember that they basically shot these episodes in a closet. The barren landscape, pools of acid, the Temple of Light, the Carcinome and the Crater of Needles–it’s all totally working for me.They’re the perfect backdrop for the amazing costumes of the Zarbi and Menoptera. I’m less convinced by the costumes of the Animus and the Optera, but I do love the Zarbi larvae guns because they basically look like giant silverfish–and to some extent like the early Cybermats (which were still years off at this point). They were intended to be scary enough to rival the Daleks (because nothing else had so far), and they absolutely do have that eerie quality you want in a Doctor Who monster. In the end, it really wasn’t enough to match the legacy of Doctor Who’s most famous creation, but to me that doesn’t take away from what they managed to create here. The most effective thing about this story for me is the interaction between characters as they break off into smaller groups. The first of which is when The Doctor and Ian go out to explore the surface of Vortis after being pulled down onto the planet. The scene where The Doctor drops Ian’s Cole Hill School tie into the pool and watches it burn is wonderful because he did it to save his life, but Ian is just annoyed about the loss of his tie. I adore William Hartnell in this story and the way he and William Russell play off each other as their characters explore the planet makes me giggle. The Doctor: Let’s have your tie. Ian: Well, I haven’t got one. The Doctor: I know you’re not wearing one, dear boy, but the one round your middle, hmm? Ian: I hope my pants stay up. The Doctor: Yes, well, that’s your affair, not mine. Poor Ian. He and Barbara both seem to struggle with not being the teachers anymore. Ian with The Doctor and Barbara with Vicki. Her reaction to Vicki telling her that she studied medicine at the age of ten, and Vicki’s assumption that she must’ve taught nursery school is priceless. Later we have The Doctor and Vicki together, trapped by the Zarbi, and the way he looks after her is very cute, but I thought it was hilarious when he tried to calm her down with chocolate. 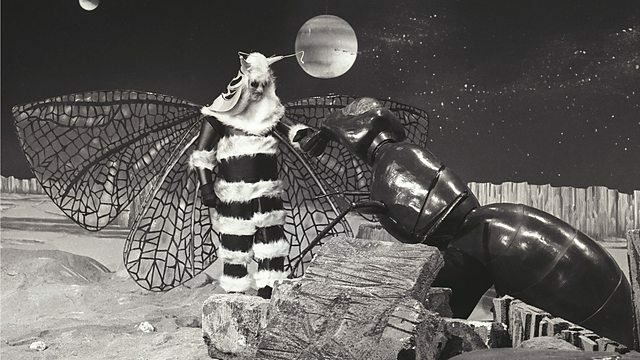 Meanwhile, Barbara forms an alliance with the Menoptera to aid them in reclaiming their planet. These moments where the companions were really allowed to shine on their own by basically playing the role of The Doctor are brilliant. I love the friendship that develops between Ian and Vrestin, and their little adventure as they go down below the ground and end up with the Optera that are sort of devolved descendants of the Menoptera. I actually felt quite sad when the one Optera was killed by the acid as they were trying to break up to the surface of the planet. By building these relationships between the characters, the writers really made me care what happened to them. That seems like a really obvious thing to do, but it’s not something that always actually happens. That said, I do have to admit that there are some parts of this story that drag for me. I think that it could’ve easily been resolved in four episodes rather than the full six, but then we would’ve also lost a few of those great moments between characters. I know that there is a popular opinion that Verity Lambert may have gone a bit far in trying to be experimental with this story, but I really enjoyed it and it definitely has a place in my list of favorite William Hartnell episodes.